Mintage levels for the half eagle would see a sharp increase after the adoption of the new specifications which reduced the value of the gold content of each coin below the face value. 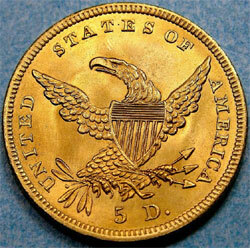 Many coins carrying the older specification would be melted down and reminted with the new Classic Head design. The first year the type was introduced, production at the Philadelphia Mint reached 657,460, representing the highest mintage for the denomination to date and nearly tripling the previous high. Although mintage levels would recede in the next few years, levels remained at elevated levels compared to previous years, as the coins gained more widespread use within circulation. The lowest mintages for this type occur for the two branch mint issues struck during 1838. Production at the Charlotte Mint would reach 17,179, while the Dahlonega Mint would strike 20,583 coins. Each of these figures was less than 10% of the lowest annual mintage for a Philadelphia issue of the series. The mintage figures for each issue of the Classic Head Half Eagle series are indicated below.